Around forty Islanders took part in the march on Saturday aiming to put pressure on the police to carry out searches at three possible burial grounds. Isle of Wight residents gathered on a very cold Saturday morning to take part in a peaceful march through Newport. 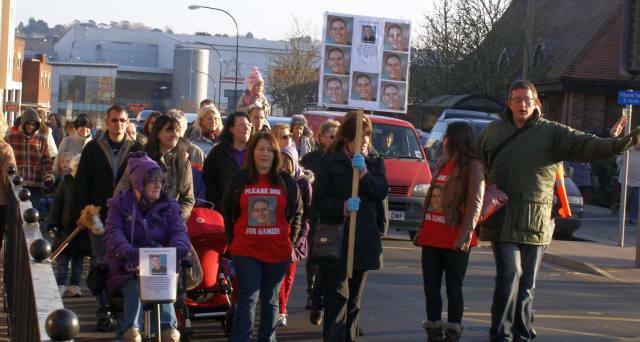 The march, organised by Cowes resident Kaley Hall, was intended to appeal to the police to carry out searches at three possible burial sites for missing teenager Damien Nettles. Around forty people of all ages took part in the march, which weaved its way from Cineworld through Newport town centre, down the High Street to the police station where it convened, attracting supportive honks from passing motorists. Kaley told On The Wight that the police officer who had given the go-ahead for the march had confirmed that he would talk to her and the marchers once they arrived at the police station. Despite waiting for some time, this did not happen. Kaley has plans to take part in the Cowes Carnival on 22nd December to raise awareness for the campaign and invites anyone wishing to supporting the campaign to join her then. 4 Comments on "Islanders march in support of Dig for Damien Nettles campaign"
The no show from the Police appears to be indicative of someone high up not wanting the case to be solved. I cannot understand why they will not do the digs when there is evidence that they might well lead to closure of the case. For the Nettles family to carry out a deep survey of the various sites where it is believed that Damien’s body may be found, the actual equipment they would need is a ‘Portable Ground Penetrating Radar System’ as used by archaeologists, which I understand some universities or archaeologists might own or can be hired. And probably used by the Police if they have the inclination to use it in this case.